GREENPOINT — A Brooklyn art dealer acted like a villain from an Indiana Jones movie by selling nearly $500,000 worth of ancient religious artifacts that had been plundered from Nepali and Indian temples, Manhattan prosecutors say. 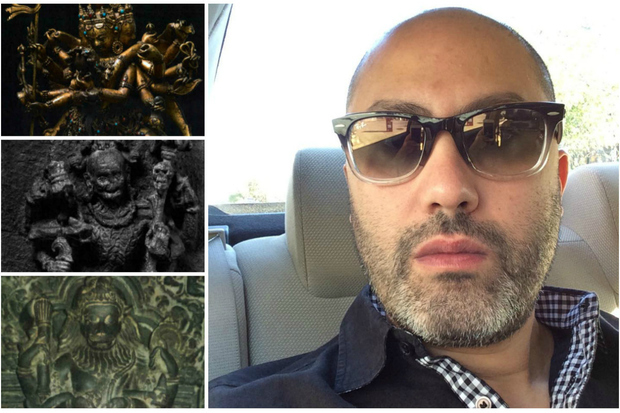 Nayef Homsi is expected to be arrested in the near future for selling three sculptures of Hindu and Buddhist deities — despite knowing the artifacts were stolen, according to civil court papers filed by Manhattan District Attorney’s Office. The illegal deals occurred between June 2012 and March 2013 — with the biggest sale being a 13th century gilt-bronze statue of the Buddhist deity Samvara for $370,000, the court papers say. The DA’s office, which partnered with the Department of Homeland Security on the investigation, filed the papers in Manhattan Civil Supreme Court on March 25, asking a judge to freeze a bank account held in the name of Homsi’s company, Maitreya, where the proceeds of the illegal sales had been deposited. “Within the next few days, the New York County District Attorney’s office intends to arrest Homsi,” Manhattan prosecutor Lynn Goodman wrote in an affidavit in support of the request. In June 2012, Homsi received the Samvara statue as a consignment from an individual whose identity was withheld in the DA’s court papers. Days later, an expert hired to investigate the ownership of the piece informed Homsi that it was “almost assuredly” the same Samvara statue stolen in 1983 from the Itum Bahal Temple in Kathmandu, Nepal, court papers say. Homsi also informed another individual that the provenance might have been falsified, the court papers say. Despite his misgivings, Homsi sold the artifact to a client in Beijing in February 2013, prosecutors claim. Homsi is also accused of selling an 11th century statue of the Hindu deity Narasimha that was made out of phyllite stone and came from the Bihari region of India. In January 2012, Homsi sent a picture of the sculpture to an unnamed co-conspirator, asking if it were still available for sale, prosecutors say. An informant for investigators examined the photo and noted that the sculpture was still encrusted in dirt — a hallmark of recently excavated or stolen antiquity, according to the court papers. Homsi sold the piece to unnamed buyers for $70,000 in March 2013. Prosecutors say that same month, Homsi sold a ninth century statue of the Hindu deity Bhairava. A day before the sale, Homsi exhibited the statue at the Upper East Side’s Arader Galleries during the city’s Asia Week, an annual celebration of Asian art. After the showing, an unnamed individual showed Homsi a photograph of the statue that indicated it had been stolen from a temple in India, according to investigators. Homsi replied that he would take the statue off the market to determine whether the statue had been pilfered, the court papers say. Instead the next day he slashed his asking price of $70,000 by $15,000 and sold the artifact to a buyer in London, according to investigators. He told DNAinfo New York on Wednesday that he did not know of any criminal investigation and denied peddling stolen artifacts. Homsi's upcoming arrest doesn't end the probe. A law enforcement source described Homsi as a "minor player" in a much larger investigation.